Petit allegro music in ballet class? Get a fiddler's tune book! “There are two parts of the class where you need more music,” the late Anatoli Grigoriev said to me after I’d played for him a few times, “petit allegro, and adage.” It was quite matter-of-fact and friendly – he liked me playing for his open classes at the (old) Urdang Academy in Shelton Street, and he was being helpful, as he knew that I didn’t have a lot of experience. He was right, too. I had always struggled with petit allegro music, because you need so much of it, more notes per second than the rest of class. I carried on struggling for years – in fact, through two 3-year stints in professional companies – without ever solving it satisfactorily. 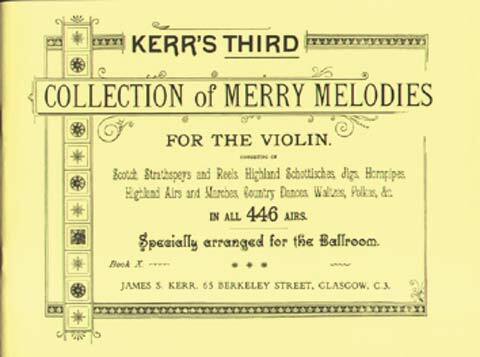 Then one day, I was in the music shop Kensington Chimes and I came across a fiddle book called Kerr’s Third Collection of Merry Melodies which I bought partly because I liked the title. But I also had a sense that I might never see another copy of the book for sale, and considering it was only £4 for 446 tunes, it was a bargain. It was also the answer to many of my petit allegro music problems. Here were literally hundreds of tunes (and that’s just volume 3) that were brilliant for class: these jigs, reels, polkas, and hornpipes had exactly the right feeling of bounce, the right beat, the right speed, and the right infectious energy. They’re hard to play, because they’ve evolved out of the ergonomics of the violin and fiddle technique. The kind of leaps that are natural and easy on the violin aren’t easy on the piano. And that’s exactly why they sound good, and much more interesting and dance-like than the piano or vocal repertoire, which tends to move more by step than leap. This explains why I bored myself with my own attempts at improvising music for petit allegro: when you improvise at the keyboard, you tend to play what fits easily under your fingers. To recreate the fiddle sound, you have to do what fits easily on a violin, and that requires a lot more work. This entry was posted in Advent calendar, Dance, Music and tagged Music, advent 2012, ballet, ballet class, dance accompaniment, folk music, tune books on December 3, 2012 1:51 pm by Jonathan Still.